There are two walking exercises in Balancing Gong. The first on is Cloud Steps雲步 and the second is Monkey Walk猴步. In Cloud Steps we walk in straight lines and turn either 90 degrees our 180 degrees. in Monkey Walk we walk a figure of eight and this covers an anti-clockwise and clockwise circle. Walking in a straight line in Cloud Steps gives us strong energy. It is like running in a straight line, you can run very fast. We also need to learn how to balance on one leg. This is very important for our brains. We need to train our brains to control our bodies by standing on one leg then we will not suffer from strokes. Cloud Steps also teaches us to walk on our heels and this makes our energy go through our spine to the brain. Turning 90 degrees and 180 degrees to our left our right teaches us detailed control of the body and coordination. All these things are good for us. Monkey Walk is a circle and so it gives us gentle energy, because when we go in circle we cannot go so fast when we turn and so we need to be more relaxed. The exercise also teaches us to open and close our arms by moving our waist. This movement also effects the palms and this is why Monkey Walk can help to develop the Palm fluttering. Being able to walk on a straight line and a circle is good for our body and mind. 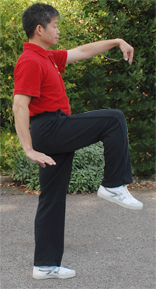 This is one of the best exercises in Dayan Qigong. I walked miles this way to recover from a knee operation. In addition, the balance aspect helps the brain, as Sifu says, as does the coordination of the hands and legs. I love this!